Christine du Toit was born on 26 March 1939 at Ceres and grew up in the Koue Bokkeveld. She matriculated from Charlie Hofmeyr High School, Ceres and studied at Stellenbosch University (BCom, SOD). She taught commercial subjects at the Calvinia High School and Paarl Girls High and lectured commercial subjects and Computer Practice at the Stellenbosch Technical College (1985-1998). She is married to Piet du Toit, author of Stylboek: Riglyne vir paslik skryf (2003) , and has a daughter and two sons. 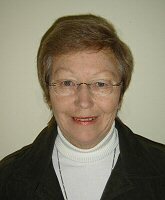 Christine du Toit (together with co-author Suzie van der Merwe) has written several computer books/manuals since 1987. These books are mainly used for training at Colleges, Technikons, Universities and schools, or for self-study projects. The emphasis is on practice-oriented computer training. Rapid development in the computer field necessitates continuous revision of the manuals. Computer Practice for PC's, Maskew Miller Longman, 1989. Visit the website of Future Managers at www.futuremanagers.net for more information.